Thank you to everyone who was able to respond to our call for evidence (survey, 14 Feb) on the Scotland’s progress with the Sustainable Development Goals (SDGs). 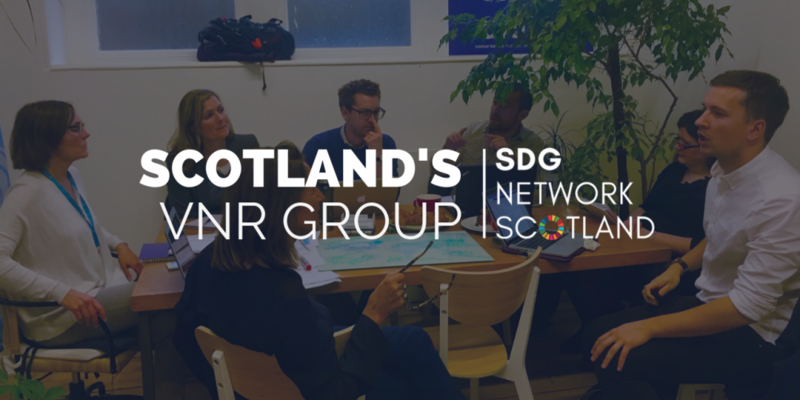 SDG Network Scotland’s VNR Working Group would now like to invite you to comment on the first draft write up of this material. Your responses to the survey, along with evidence from the discussion paper on Scotland’s current performance against the SDGs, and policy/analytical perspectives from partners and within the Scottish Government, have now been written up into draft Goal based chapters. These chapters will form the basis of a Scottish Supplementary Reviewwhich will capture a full picture of performance and actions to help inform our long term thinking on delivery of the National Performance Framework and the SDGs. Our thanks go to all those who have helped to get us to this stage. The UK Government is in the process of putting together its Voluntary National Review which will be launched at the UN High Political Forum in New York in July 2019 and is working with the Devolved Administrations to gather their input into the VNR. Scotland’s contribution to the UK Government Voluntary National Review (VNR) will be drawn from the material contained in our Supplementary Review. Once we have revised the first draft of the Supplementary Review following your comments we will provide this material to the UK Government for inclusion in the VNR in the week of 8 April. However we expect that not all of what we capture will be included in the final version. While we are planning on publishing our Supplementary Review separately from the VNR we expect it will have visibility at the UN High Level Political Forum in July 2019 through the UK Government presentation at this. We would like to know what you think of our first draft of the Scottish Supplementary Review. This really is a work in progress so some bits are more developed and refined than others. For example, some chapters still feel very government focused, so we need your help to include more examples from other sectors and civil society. We are still developing the challenges and next steps, so again your perspective is valuable here too. This is an opportunity for you to comment at an early stage so that we can draw on your experience from the beginning. The public, in particular: those concerned about sustainable development; and relevant civil society groups, organisations, academics, businesses and practitioners. In order that we can use your input to inform the VNR, please respond by Wednesday 10th April. We appreciate this does not give much time, however, we are up against challenging deadlines. We have created separate folders (https://drive.google.com/drive/folders/1qXshx-4-oImlsXT0xMV5iPHDQT0aAUMH?usp=sharing) for each Goal draft so you can read to the one/s you are interested in – we do not expect you to comment on all the Goal chapters and recognise that due to interlinkages there will be decisions to be taken on what goes where. You can then click on the table which invites you to complete four questions on the Goal/s of your choice. These cover; use of evidence; policies and actions taken; choice of case studies and; challenges and next steps. Contact SDG Network Coordinator, Paul Bradley, at paul.bradley@scvo.org.uk and Scottish Government National Outcomes and SDG lead, Victoria Loughlan, at victoria.loughlan@gov.scot. Thank you for joining the conversation on Scotland’s progress towards the SDGs and doing your bit to make sure we work together on this.